I love Jerusalem artichokes for their vigour. Indestructible, impossible to discourage, they continue to spread underground, shooting up robust stalks ten or twelve feet tall, year after year. Demanding little or no attention from me and not bothered by any insect pests or diseases, this perennial sunflower brightens the garden with gold blooms in October and offers an abundance of tasty tubers for the table. I’m compelled to admire such an unfailing, useful plant. It illustrates for me the kind of positive energy we need in today’s scary, uncertain world. Indigenous peoples here in North America cultivated Helianthus tuberosus, then introduced it to early settlers who, in turn, carried it over to Europe. A name came back. “Jerusalem” derives not from the place but from “girasole”, Italian for sunflower, and “artichoke” because some people, including Samuel de Champlain, thought the tubers tasted like globe artichokes. In fact, they have their own nutty, sweet flavour. 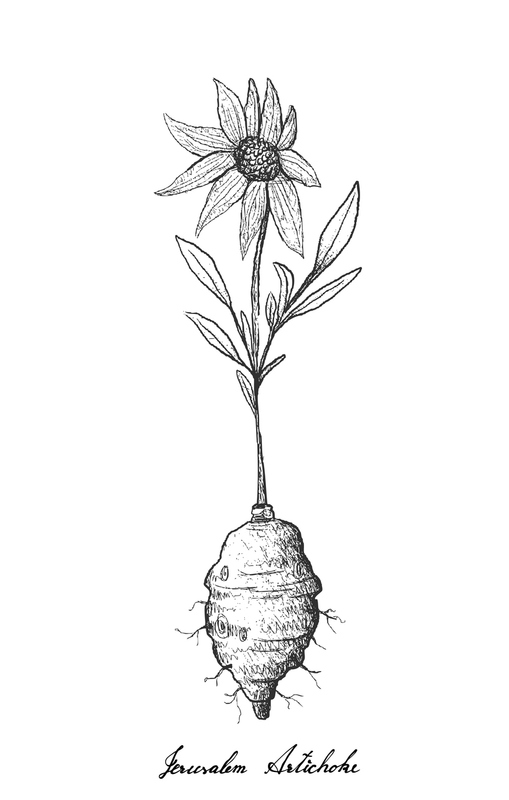 To establish a clump of Jerusalem Artichokes, pick a spot where they’ll be more or less permanently welcome and place tubers in the earth three inches deep. Their height makes a row of these sunflowers an excellent sun and wind screen for more tender crops or an effective camouflage for the compost pile. If you can’t find tubers for planting, often you can get some from a neighbour. I understand that occasionally they’re even in the supermarket although I’ve never seen them there. As early in spring as you can dig is the ideal planting time, but fall is okay too. Harvest takes place in the autumn after flowering and a frost or two. There is no chance you will eradicate the whole patch while harvesting. A few bits always elude the shovel and sprout the following May. Once the tall stalks have died, cut them back leaving enough to stick up through the snow to mark the spot for later harvests. Dig tubers until the ground freezes, then again in January and in March. This thin-skinned vegetable keeps only a couple of days in the fridge. Storage in sand in a root cellar is sometimes successful for longer periods. Because of Jerusalem artichoke’s productivity (fifteen tons to the acre compared with three tons per acre for the potato), homemakers in the 1940’s grew it in their war gardens. Its value as food is comparable to the potato’s. Eat them raw, sliced thin and tossed in a salad with onions, grated carrots and perhaps apple and a vinaigrette. Cook them as you would potatoes and serve with butter and salt and pepper. As much as I enjoy Ms. Perenyi’s thoughts and opinions, I disagree about Helianthus tuberosus. I don’t think of Jerusalem artichoke as a substitute for anything. I confess I don’t even eat them often. But wouldn’t be without a clump because I can count on them to produce. With all the talk of environmental calamity and extremes of all sorts, they are a reassuring token of plenty.